The mother of all Messier Marathon pages, with plenty of marathon history, search sequences, favorable dates, links and more, is here. Amazingly, some people run the M-Cubed: the Messier Marathon from Memory. No maps, no charts, just you, your instrument, and a checklist. Stephen Saber takes it a step further and dispenses with the checklist: not only do you have to remember the locations of all of the Messier objects, but also the search sequence and the identities of all 110 objects. He writes, “I have used this technique to manually hunt and observe all 110 Messiers from Arizona, and 109 on four occasions from 41°N latitude without the aid of starcharts, notes, or red light. Very liberating.” His thoughts on the M-Cubed, and his search sequence, are here. If you are looking for a good observing guide to the Messier objects, or if you’re even thinking about thinking about running a Messier Marathon (and you should be), I can’t recommend Harvard Pennington’s Year-Round Messier Marathon Field Guide highly enough. It has a lot of useful tips for anyone getting started in deep sky observing, even if you just got your telescope today. I also recommend the only other book specifically about Messier Marathons: Don Machholz’s The Observing Guide to the Messier Marathon: A Handbook and Atlas . Machholz was one of the independent inventors of the Messier Marathon, and his book is packed with loads of data and helpful insights. Both books are top notch, and they have complimentary strengths; I’ll probably get around to thoroughly reviewing both of them one of these days. I found this all-sky map showing the positions of the Messier objects (except the contentious M102) here on Wikimedia Commons. 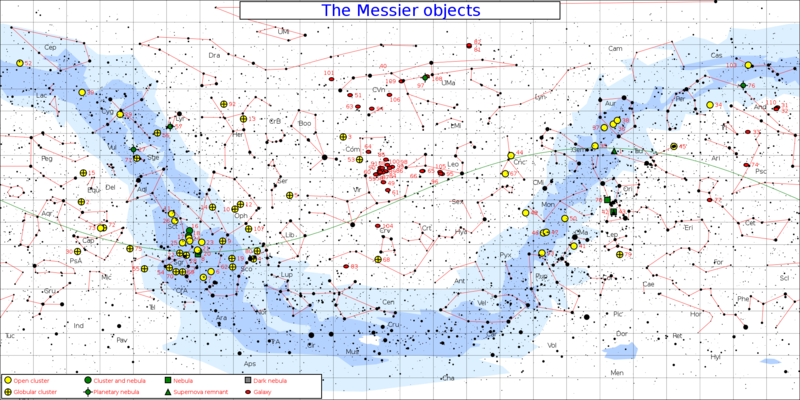 For detailed charts for finding all of the Messier objects, see either of the books mentioned above, or any good general star atlas; Sky & Telescope’s Pocket Sky Atlas is my personal favorite. Finally, if you need some inspiration, remember that people have observed all 110 Messiers with instruments as small as 7×50 binoculars. Jay Reynolds Freeman has completed the Messier list at least twice with 50mm binoculars and with telescopes ranging from 55mm to 360mm. His thoughts on the joy and challenge of observing the Messiers with instruments of all sizes are well worth reading. UPDATE March 10, 2013–I just realized that a bunch of links on this page were out of date. In particular, the SEDS Messier Marathon page, Jay Reynolds Freeman, and Stephen Saber all migrated to new URLs while I was not looking! As far as I can tell, everything is fixed now, but please do leave a comment if you find any broken links.